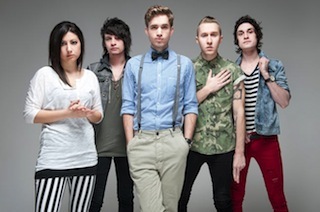 The Summer Set are shooting a new music video today (February 14th) for the track "Lightning In A Bottle." A behind the scenes photo from the set of drummer Jess Bowen can be found below. Remaining dates and ticket information for the band's current Legendary Acoustic tour can be found here. "Hair and make up with the lovely @mynxiiwhite time to shoot a video for #LightningInABottle"